At the risk of adding to the burden of seasonal round robins here’s a quick update from us at Connect8. 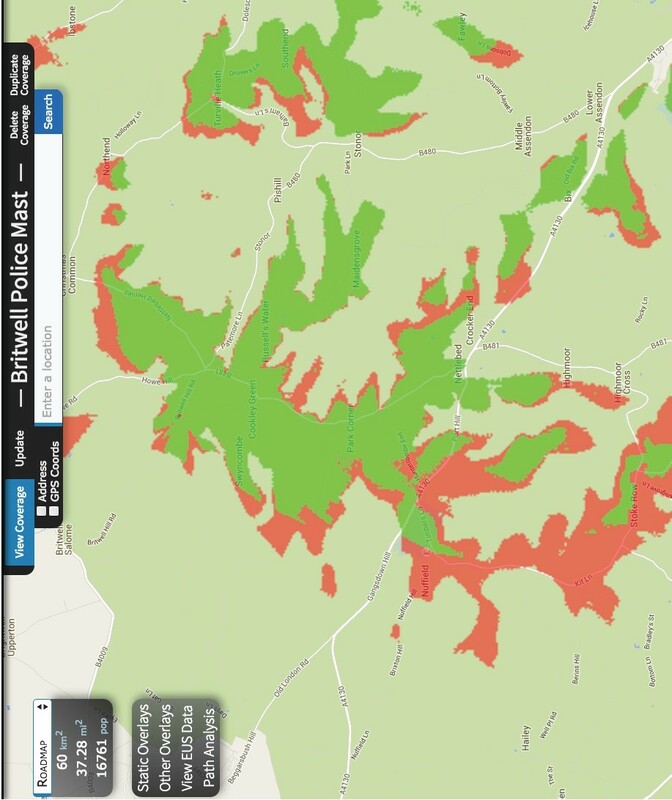 We are delighted that Village Networks (who provide broadband in Hambleden Valley) have come up with a multi­stage plan that could bring broadband to hundreds of local homes using radio signals from the Britwell Hill police masts. In the same way that TV, satellite, 3G and 4G mobile phones use radio signals so can broadband. The service would be more or less indistinguishable from BT ‘superfast’ ADSL. It’s affordable and do­able, if we can clear a couple of obstacles. Stage one would reach the homes below, which receive radio signals in a direct line from the mast. The green zones should be fine, the red ones probable (click map to get to full size). Stage 2, which could be implemented quickly thereafter would bring in the ‘deeper’ sections of the Stonor valley, by relaying the signal from Britwell Hill back up the valley. Unexpected radio signal congestion on the police masts – we are trying to find a frequency slot that doesn’t cause interference with the police. Think of this as like driving around a shopping centre carpark in the sales looking for a free space…..
Getting the internet to the Britwell Hill masts for onward distribution to us (known as ‘backhaul’). Village Networks are in talks with RAF Benson to see if we can get a radio link from there – the Government is keen that taxpayers can use public infrastructure to help broadband. We’ll let you know when we make progress on these. If we can’t get this to work, then we’ll find another route! We continue to enjoy excellent support from our SODC Cllr Anna Badcock, OCC Cllr Steve Harrod and ourMP John Howell and Ed Vaizey the Minister, as well as from officers in the police and armed services. We have been talking to the staff of the House of Commons Select Committee on Culture, Media and Sport (DCMS), who have expressed an interest in visiting us to take evidence as part of their inquiry into ‘superfast connectivity’. If anything comes of that we’ll let you know, and it may well take place in February. Finally we maintain our contact with the OCC Better Broadband team as part of our drive to ensure that fibre is enabled at Cuxham, Britwell Salome and Christmas Common and virtually all around us. This contact has been reinforced following the personal intervention of Bill Murphy the head of BT OpenReach – a meeting has been set up for late January with the new Partnership Director for the SE to discuss all the points above as we remain convinced that it will take a combination of fibre and radio to give us the 100% coverage we are looking for.